SWR with other programs? Feel free to browse here, and mail me at m.tanksley@gmail.com if you have any other questions. 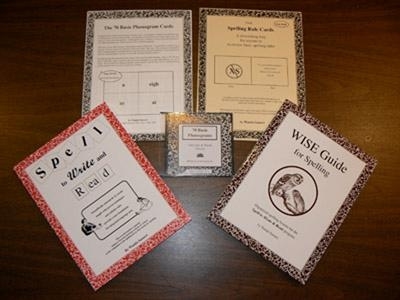 Spell to Write and Read, or SWR, has received great reviews from many of the public and private schools, homeschoolers, and magazines who have used or reviewed it. Most spelling or phonics programs are based on simply what's been used before. This unique program starts with the student writing and spelling, and moves to reading. Based on solid physiological research and historical precedent, Spell to Write and Read will amaze you with its simplicity, conciseness, and completeness. A time-proven method with over 50 years of success throughout the States! I'm neither an expert nor a long-time user of SWR. And I'm certainly not qualified to tell you why SWR is superior. But, I researched quite a bit before I went with SWR and I can share why I chose and have stayed with SWR. still do desire) for someone to hold my hand. For a number of reasons I took the plunge and decided to give SWR a try. However, if I had not had the opportunity to take a seminar or at least meet with a trainer for a crash course I'm not sure I could have stuck with it. Somewhere between meeting with a trainer for a crash course and attending a seminar I came to the realization that SWR is not about doing a daily lesson and checking it off my list. It is about learning, both me learning my child and my child learning the English language. I have been using the program consistently since September and believe the scripted lessons and workbooks I initially viewed as a necessity are actually a hindrance in the teaching process. Imho, the scripted lessons bind you into following a very specific program. What SWR lets you do is teach your child in the manner he or she best learns. I think SWR lets you be freer to do what your dc needs to do and sets you free of the busyness of a canned curriculum. And in time, I believe SWR is more likely to engage your child in creative expression of the English language. When I look at curriculums one of the biggest questions I ask is, is this program merely training a child to read and produce answers for a test? Or will this program help me train my child to think, reason, and analyze? When my child has completed this program will they have internalized the information and be changed by it? My dc are too young and my hsing experience has been too short for me to have wisdom of hindsight. But, when I talk to people who have experience in both Saxon and SWR I find I want my dc to know English more like those who have used SWR than those who have not.